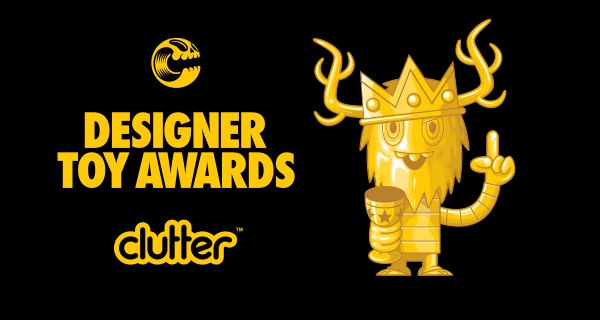 The germ of the idea that grew to be The Designer Toy Awards, was first planted back in 2008, while on a studio visit with UK illustrator Pete Fowler and his business manager Rob Manley. It was actually an interview for issue 12 of Clutter Magazine, that became a discussion about why there wasn't more celebration within the toy community and that someone should really create an awards ceremony to recognize the hard work and talent that is sometimes left to go unnoticed. 3 years later (2011), saw this plant grow into the first Designer Toy Awards ceremony held in July during SDCC. When conceiving how the actual award (the Toy King) would look, it made total sense to us to go back to that original conversation and invite Pete Fowler to bring it to life. The result was better than we could have hoped, and now everyone can't wait to hold one in their hands. Partnering with Munky King, the ceremony took place during their Black Ball event and was hosted by Sean Leonard to an excited audience and a huge success. The awards were produced by LA based Pretty in Plastic, who worked hand in hand with Fowler to craft the beautiful pieces. In 2012 we brought the event back to our home turf of NYC, hosting the event at the historic Providence NYC, one of New York City's most opulent venues! Located in Midtown Manhattan, Providence NYC was formerly a church and then a recording studio, where The Rolling Stones, Jimi Hendrix, Guns N' Roses, John Lenon and many other legends recorded their magic. 2017 marks a pivotal moment in the life of the DTAs, moving its home to be part of Five Points Festival, New York Cities premier Designer Toy and Comic Festival. From small beginnings grow big things, and we are excited to add a little more magic each year.